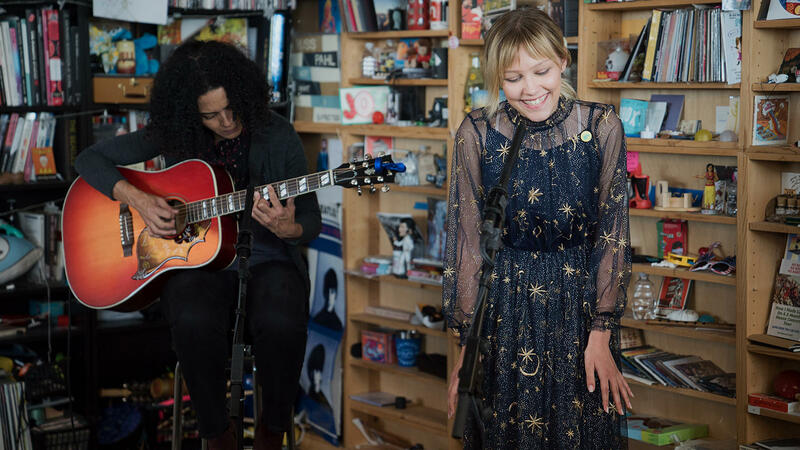 Grace VanderWaal performs a Tiny Desk Concert on May 1, 2018. When 14-year-old Grace VanderWaal came to perform at the Tiny Desk I had to confess to her (and her mom) that, until my "accidental concert experience," I had no idea who she was, nor did I know what America's Got Talent was. It all started this past February, when I went to the 9:30 Club, a 1,200 capacity music venue, to see what I thought was a show by rock guitarist Grace Vonderkuhn and her power trio from Delaware. When I arrived for the unusually early 7:30pm show, I saw a long line of young teens wrapping around the block, mostly girls, and a fair smattering of adults who didn't look like the regular concert goers who head to the 9:30 Club on a weekday evening. And as you've likely guessed by now, the show I was about to witness was not the riff-rock guitar player we'd recently featured on All Songs Considered but a very different sort of wunderkind who won the hearts of millions as the 11th winner of America's Got Talent and, now, a Columbia recording artist. Inside the club was a massively enthralled and enthused crowd and it didn't take long for me, one of the few older guys in the club, to also be completely swept away by her performance. It was a dazzling show that felt fresh, sincere, bold but also simple, with Grace on ukulele singing songs such as "Moonlight," a song about a friend dealing with mental health issues, which she also performs here at my desk. And she's about to break"
Despite what I feel is my broad love of music, I was reminded how easy it is to get comfortable in the musical confines we devise for ourselves. It's easy to stereotype artists and perhaps be dismissive of something that falls outside our comfort zone. But Grace's show and music reminds me to keep my thoughts and judgements open. So, if you're about to pass on watching this one, figuring you're not going to connect with a young teen and her music, stop. Take a deep breath, open up your heart and let Grace VanderWaal enchant you with her unique talent. Grace VanderWaal's current album is called Just the Beginning. Producers: Bob Boilen, Morgan Noelle Smith; Creative Director: Bob Boilen; Audio Engineer: Josh Rogosin; Videographers: Morgan Noelle Smith, Maia Stern; Production Assistant: Niki Walker; Photo: Claire Harbage/NPR.